As I’ve shared, since late August I’ve been focused on clean eating. This was kickstarted by the Whole30 diet plan which has now transitioned into a lifestyle for me. Although I have been focused on healthy eating, I believe diet is really personal so I have not forced my diet choices on my family – however – after getting through the fall without any sugar or processed foods, I became very aware of how much sugar and processed foods the kids (and my husband) were eating. Some of the foods were ones that we purchased as a family, including snacks, cereals, and granola bars, but for the most part the processed or sugar foods they ate were outside of the home. This included school celebrations, extracurricular activities, dining out, and of course all things holidays. I addressed my concerns in December, but it did not seem like the timing was right to make any major changes. We were amidst the holiday celebrations and about to go on vacation with my family. It did not feel right to ask them to give up sugar at that time. But, it did seem appropriate to discuss it as a family and come up with a plan for change. I explained my concerns and asked the children if they would be willing to do a one month no sugar challenge. We discussed how we would overcome obstacles and what I would do in order to make the month easier. This included coming up with special treats that were made from whole foods and did not require added sugar. The kids agreed and so we began the challenge January 1st. Overall, the month went really well and the kids did a great job explaining to friends and their parents about our challenge in order to follow through with their commitment. I have to say I am quite proud. And as they stayed true to their word, I also stayed true to mine. We came up with various treats that they could still enjoy throughout the month. 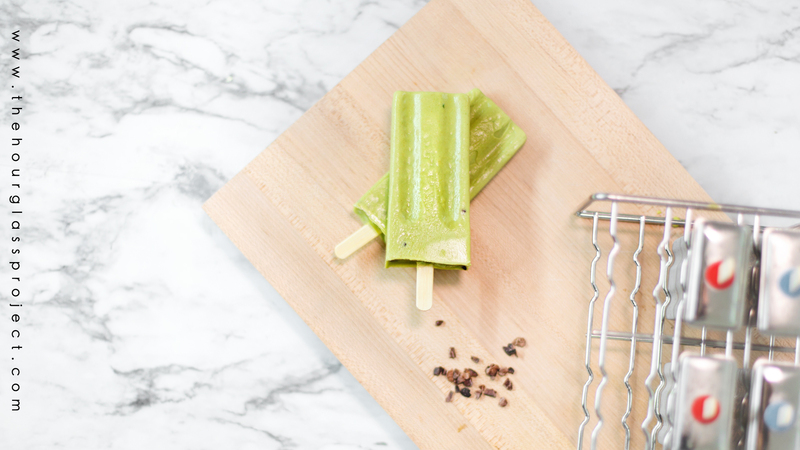 Our absolute favorite was our clean eating popsicles in which we used coconut milk and dates as our primary base for the popsicles. We have had so much fun testing various flavors this past month. One of our absolute favorites was one that I created for my birthday. 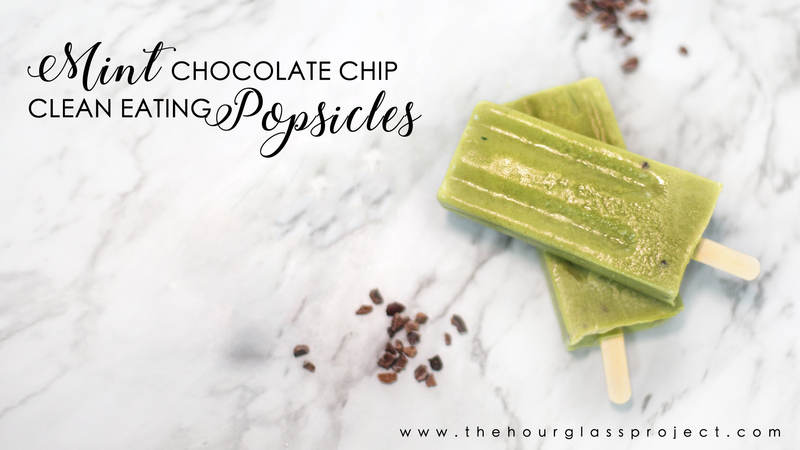 I’ve never been a big ice cream fan, but I love me some mint chocolate chip – so I was determined to create a simple recipe for mint chocolate chip popsicles – and I succeeded. We LOVED these. I posted them on my instagram (@thehourglassproject) and got several direct messages asking for the recipe, so I figured I’d write it up on the blog. It is super easy and only takes about 10-15 minutes to prep and then of course overnight to freeze. I hope you enjoy as much as we do! Feel free to modify the recipe to your taste as well. You can always taste test the mixture before you pour it into the molds and freeze. Perhaps you like more mint or more nibs! 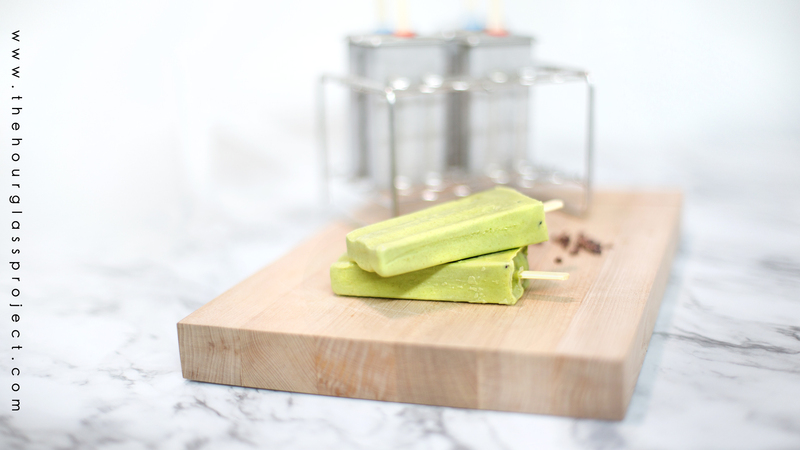 Or maybe you want more spinach for a brighter color – or no spinach in your popsicles. Also, we have two sets of popsicle molds. I purchased one at Ikea for a few bucks and I also invested in a stainless steel popsicle mold from Amazon (as pictured). They both work great – so don’t feel like you need to get anything crazy expensive to make this work! Also, a helpful tip is to run them under warm water really quickly to help release them from the mold before serving! We try to make them nightly taking them out of their molds and storing them in pyrex with wax paper separating each popsicle, so we have them ready to go at all times. They have been a wild hit in our home and will help us continue the process of clean eating way past this January challenge. Let me know if you try this recipe! I’d love to get your feedback!